He talked of how journalism had always been what he'd wanted to do since he was a little kid. Of how chasing a story could feel a little like chasing a drug, getting high, moving on to the next one. Of how covering a war had seemed like the ultimate hit. "And what do you think now?" she asked. "Is it what you expected?" I have gotten fairly good at choosing books that I know I will like. 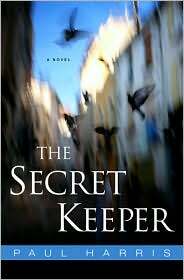 Occasionally I come across a book that proves to be disappointing, but, fortunately, that was not the case with Paul Harris’ The Secret Keeper. Far from it. The novel held me in suspense throughout and had me thinking of it even when I was unable to read. I even dreamt of Sierra Leone one night; I was stopping at checkpoint after checkpoint on my way out of Freetown for a purpose I did not know. Danny Kellerman at least had a purpose. He had snagged an assignment in the war torn country of Sierra Leone, his own dream come true. It was a promise of excitement and to be right in the middle of something big. A place where he could make a name for himself. His life was irrevocably changed by his experiences in Sierra Leone. He saw the unimaginable, the horrors of war, and it hit way too close to home. Seeking normalcy, Danny returned to his life in London. He settled into life with a new girlfriend, Rachel, and continued to work at the paper. His relationship with his ailing father continued to leave a sour taste in his mouth, the two never quite being able to see eye to eye. Danny thought his life was going along okay, even despite the emptiness he felt; at least until he received a letter in the mail from a long lost friend. Maria Consuelo Tirado had been the one. He had once thought she was the love of his life; only their lives had taken them in completely different directions. Maria’s ties to Sierra Leone bound her there while Danny was only too eager to get away after the civil war at last seemed to come to an end. Her letter, however, called him back. Maria needed his help. She was in trouble. Danny was at first reluctant to go, but after learning that she had been killed in a roadside robbery, he knew he had to convince his editor to let him go back to Sierra Leone. Even if it put his relationship with Rachel in jeopardy, he had to find the truth. Was Maria’s death a simple case of being in the wrong place at the wrong time or was it a planned murder? The country had changed much since his last visit there four years before. And yet, it had changed so little. His old friend and guide, Kam, seemed to have prospered during Danny’s absence, while Danny’s friend Ali Alhoun worried about his business in a country that was fast becoming unfriendly to “foreigners”. I really liked reading about the journalists’ interactions with each other and seeing them in action. There was a definite competitive edge, but there also seemed to be a camaraderie between them—they helped each other out and looked after each other. Perhaps it will come as no surprise that what drew me most to the story was that of the child soldiers. War is such an ugly thing and to bring children into it is unimaginable to many of us. And yet it happens. Children are ripped from their families and forced into service as soldiers, sometimes, often times, being asked to do terrible things. One of the most heart wrenching stories in the novel is of a mother separated from her son after having lost all of her other children. The details of it made me mad and oh so sad. Unfortunately, stories like that are all too true. Maria worked with child soldiers, trying to rehabilitate them; she was an U.S. aide worker, very passionate about her job. While others looked at these young men and saw only cold blooded killers, she saw children whose childhoods had been completely stolen away. They and their families were victims of a terrible war. It is no wonder Danny fell head over heels for Maria. She was beautiful, strong and independent, not afraid to stand up for what she believed in. I liked Danny right from the start. He was troubled and flawed. He was never cocky, just confident. He was smart and thoughtful. When he had first arrived in Sierra Leone during the war, he was still a bit idealistic and caught up in the euphoria of a new experience, not to mention being in the middle of a situation that was a constant adrenalin rush. Even the more experienced journalists were not immune to it. Paul Harris captured that so well in his writing. The author also painted a realistic picture of an older Danny. He’d lived a lifetime during his short time in Sierra Leone. The weight of his experiences was heavy on his shoulders, and Harris made me feel that. I felt Danny’s confusion and grief as well as his rage. Another aspect of the novel that especially interested me was the setting of Sierra Leone. I was not too familiar with Sierra Leone until I saw the movie Blood Diamond. After seeing it, I researched the country and its history, trying to find out what was true and what was fiction, and to try to gain a better understanding of what was really going on there. It was interesting to read about Harris’ Sierra Leone in The Secret Keeper. I could feel the heat beating down on me just as Danny could. I especially liked the juxtaposition of the old Sierra Leone with the new, as Harris weaved the past with the present throughout the novel. There is so much I want to say about this novel. There was so much to it, but then you might not want to read the book if I give it all away! It is not just a mystery thriller. There is certainly mystery and plenty of suspense, but I think the underlying stories of the characters, their relationships and their personal struggles are very much a part of what makes this book great. I loved how the author demonstrated that nothing in the world is black and white. Nothing is as simple as it may seem. People are complex as are the situations they may find themselves in. Paul Harris has earned a place on my must read list. I wish he’d hurry up and finish his next book so I can read it. I admit to being a bit fascinated by Paul Harris and his career as a journalist. He has traveled the world on assignments, including to Sierra Leone, the setting of his novel, The Secret Keeper. I am thrilled to have him here as a guest on my blog and was even more excited when I got a sneak peek at what he had written. I don’t think you will be disappointed! 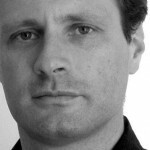 Please join me in welcoming Paul Harris to Musings of a Bookish Kitty! I still don’t really consider myself an author. Not yet. I’ve been incredibly lucky to have a novel published but I always have been – and remain – a journalist first and foremost. That is my day job. But writing The Secret Keeper allowed me to explore some of the experiences I have had as a journalist through the medium of fiction. Perhaps strangely I hope that a deeper version of the truth might have come out as a result. Journalism is by its nature limited. For better or for worse (and sometimes it is really not clear which) journalism is limited by what the reporter can prove or has seen. Facts and interviews and reportage are scrambled together against a deadline. But fiction can reflect what a writer knows to be true. Or feels in their gut to be right. As such writing The Secret Keeper was a liberating experience in that it allowed me to look at things in an obscure part of Africa that meant a lot to me but not much to the outside world. And it allowed me to do it my way, saying what I wanted to say, not just what I could glean from a notebook. Wendy wrote me an email saying: “As a war correspondent, I imagine it would be impossible not to be touched and influenced by everything you see going on around you.” That is true. But the picture that emerges is a complex one. Few people cover wars or crises such as natural disasters or famines and emerge untouched. It is impossible not be moved by the suffering and the tragedies and, most often, the sheer pointless of most of the reasons why these disasters happen. But there is another side too. Journalists, like everyone else in a conflict, are also participants in these events. As such they have their own agendas, both personal and professional, just like aid workers or politicians or warring combatants. Journalists go to war not just to expose the plight of the innocent. They also do it for ego, for the excitement and to further their careers. It is a dirty little secret and not one limited to reporters or wars. I covered a famine in Ethiopia once and was astonished to hear aid workers from “rival” organisations grumbling about each other’s activities as if they were in a competitive sports game. They expressed all the bitterness or triumph or petty jealousies of each other’s aid activities as Mets and Yankees fans do when talking about who has the better team. Journalists can be like that too. Several incidents in the book are based on real experiences I had in Sierra Leone. One in particular stands out. I had been present at a protest outside a rebel leader’s house in the capital Freetown. My driver had spotted signs of trouble and spirited me away five minutes before shooting broke out and several protestors were killed. One of my colleagues was less lucky. She had been caught up in the thick of it, fortunately escaping with her life despite the flying bullets. Now, looking back, I am deeply grateful for the wisdom and foresight of my driver. But back then – and I still hate to admit this (it feels so, so warped now) – I felt a huge streak of professional and personal envy. Genuine jealousy at her brush with death. She had an amazing story to tell her colleagues, many of whom measured success by closeness to the action. And, even better, her account of the day had sailed onto her newspaper’s front page. Perhaps a little of the reason why I wrote The Secret Keeper was to process emotions and experiences like that. To get out that version of the truth, which exists far beyond the notebooks, interviews and TV pictures that make up journalism. Truth can be stranger than fiction, but sometimes fiction can hold a deeper truth than journalism. Check out Paul Harris' website for more information about the author and his book. And visit TLC Book Tours for a list of Paul Harris' tour stops! Many thanks to author Paul Harris and TLC Book Tours for the opportunity to be a part of this book tour. Glad you enjoyed this! Not my kind of book, but I still enjoyed your review! I only skimmed this because I have the book waiting to be read and didn't want to risk reading any spoilers. I DID read your opinions of it though, and the interview with the author. This looks like it will be a GREAT book and I can't wait to get started. I've enjoyed reading the reviews on this tour. It sounds wonderful, and the author is also a very compelling guy. I'll need to get my hands on this one! I've heard good things about this one. You've confirmed it! The Secret Keeper sounds interesting if heartbreaking but Paul Harris's insights on his own and his colleagues motivations makes me really want to read his books. I am so going to read this book!!! I truly enjoy novels like this and children soldiers is a topic that I feel the world needs to read about whether it's a non-fiction book or a fiction story laced with actual happenings in these war torn areas. Excellent review and post as always!!! I really enjoyed this book as well Wendy. The child soldiers definitely had the biggest impact on me. It's horrifying to think of kids being used in that way. Wendy! Excellent review! Thanks so much for the time and energy you put into reading and reviewing The Secret Keeper. It was really interesting to read the authors words about his experiences too. Great job! Great review, Wendy! This does sound like it would be a good read. I also enjoyed reading the guest post about the author's experiences as a journalist. I'm interested in this book because of the setting. Great review. Dar - I need to go back and catch up on the reviews for this one, including yours. I am glad you enjoyed it too. The whole concept of child soldiers is heartbreaking and then to think of how they are torn from their families . . . It's devastating on so many levels. Lisa - Thank you so much, Lisa. I am glad I got the chance to read this one. I can already think of several people who I think would enjoy this one as much as I did. Birthday presents maybe? Nat - I really enjoyed the guest post as well. I think what the author said about truth coming out in fiction is so true. Kathy - The setting was one of the major draws for me too. Melody - Thanks, Melody! It really is a good one. Kelly - I can see how this might not be a book for everyone, especially because of the subject matter. Heather - I understand. I look forward to reading what you think of it. Sandy - Yes, the author is quite compelling. I am looking forward to reading more by him in the future. Jenclair - I haven't read too many reviews of it yet, I admit. I think it deserves the praise its getting though. Carrie - It really is an interesting book on many levels. I hope you do get the chance to read this one. I have this one checked out from the library, so am glad to hear you enjoyed it. It sounds like a very contemporary plotline, which should be a nice change of pace for me! Danielle - I hope you like it when you read it. It definitely is fitting for today. There are so many countries in Africa and most of them in so much turmoil. I don't know much about Sierra Leone either (I did see Blood Diamond) but I do think that even if it's a fictional account to read about a different country at least gives you a bit more perspective you know. This sounds very good, may be not an easy read what with the subject matter, but I'm definitely adding it to my list! Thank you for such a thoughtful review. Iliana - It sure seems that way, doesn't it? This wasn't always an easy read subject matter wise, but it's definitely worth reading, I think. I'm a little behind on my blog reading! Your review was fantastic! I've heard alot of good about this book and have added to my list! Lisa - I need to do a little catching up myself. Thank you for your kind words! this is a fantastic first novel by a journalist. I really enjoyed Harris' narration and how real it seemed...which I think in part can be attributed to his own personal experiences in Sierra Leone. This is one of the best books I've read this year. Thanks for a lovely review. Serena - It really was good, wasn't it? I'm so glad I read it. Sunday Salon: What About That Ending?